Their royal baby is finally coming home! We're not talking Wills and Kate here but the Queen's Baton for the Gold Coast Commonwealth Games next April. The Gold Coast-inspired, Brisbane-made baton has now traversed the globe on the longest most interactive baton relay in Games history. From a start at Buckingham Palace in March, the baton has travelled more than 200,000km through 69 nations and territories. It has been carried by hundreds of thousands of hands as it swung across the jungle in Africa, swam with stingrays in the Caribbean, posed for photos at the Taj Mahal and paraded with Mounties in Canada. And co-designers Warren Schroder and Alex Wall couldn't be more proud. “We've been keeping track of it every step of the way and have enjoyed seeing people across the Commonwealth interact with the baton,” Schroder said. The Queen's Baton arrives in Brisbane on the morning of Christmas Eve, December 24 – marking 100 days to the Gold Coast Commonwealth Games Opening Ceremony on April 4. 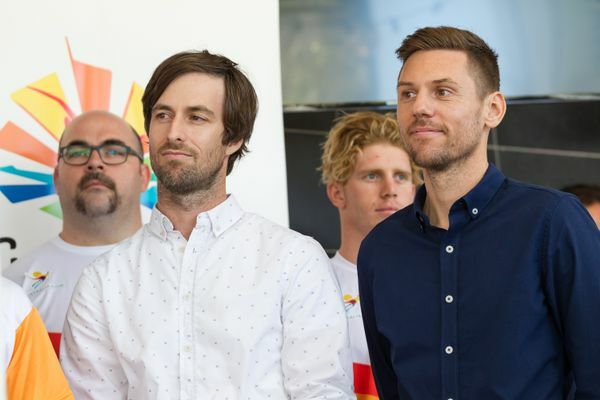 “We're happy now it is coming back to Australia and we are looking forward to seeing how Australians interact with the baton and what they think of it,” Schroder said. The baton will spend the first week in January 2018 visiting locations and events in Queensland including the Brisbane International tennis (January 6 and 7), Stradbroke Island (January 8), the Magic Millions draw on Surfers Paradise beach (January 9), Palm Island (January 10) and Springbrook National Park (Natural Bridge) and the Q1 observation deck on the Gold Coast (January 12). The around-Australia relay proper starts in Canberra, coinciding with Australia Day celebrations on January 26. After circumnavigating the continent in a clockwise direction, the baton returns to Queensland through Horn Island in the Torres Strait on March 3. It will then travel through the amazing Outback, to the lush tropical north, onto the World Heritage-listed Great Barrier Reef and then the beautiful Whitsundays just to name a handful of stunning Queensland holiday destinations it will visit. More than 1800 Queenslanders will carry it through 83 communities to its final destination - the Gold Coast's Carrara Stadium. There, on the evening of Wednesday, April 4, as part of the GC2018 Opening Ceremony, a message from Her Majesty Queen Elizabeth II – written on spinifex paper and concealed inside the baton – will be read by Prince Charles. It has been an epic journey for the baton, which began as a small log of macadamia timber found on the forest floor in the Gold Coast Hinterland. The prized native wood was expertly carved into an elongated loop then fused with a piece of recycled plastic – representing both sustainability and environmental awareness, according to Schroder and Wall, from the West End (Brisbane)-based design company Designworks. To represent the Gold Coast's history of glitz and its transformation into an internationally recognised world-class tourist destination, colourful LED lights were added along with a platinum band engraved with the names of the 70 Commonwealth nations. A tiny but powerful GPS tracker was also installed to allow the baton's journey to be followed on the internet. “It's got the natural environment as well as the bold energy of the Gold Coast people,” Schroder said. “It had to be a rugged product to deal with being handled so much and to continue to work in all extremes of weather. The baton bearers were chosen to recognise the achievements and aspirations of Queenslanders from all walks of life, from ambitious youngsters to humble volunteers and well-known Australians from a variety of fields. Among them are sports stars including Susie O'Neill, Kieren Perkins, Brooke Hanson and Hayley Lewis (swimming); Justin Hodges (rugby league); Raelene Boyle (athletics); Tige Simmons (basketball) Tracey Hannah (mountain biking) to name just a few. There are also many luminaries from other fields. They include Dr Ian Frazer (medicine); Dami Im (entertainment industry); Nic Marchesi and Lucas Patchett (charity workers); John Wagner (Toowoomba businessman) and Gerard Gosens (chocolatier and adventurer). Schroder has called on everyone to line the streets when the baton passes through their city, town or region over the next 100 days. “Those who have the opportunity to carry the baton are all people who have done incredible things in the community,” he said.